It was a time for celebration and for ceremony…for reflection and for renewal. Everyone was invited to wear a costume, bring an instrument, make a dance, join a dance. 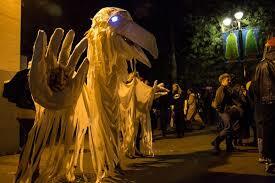 The Parade of lost Souls is for you and by you, all the lost souls of the world. It beckons you to bring your past and your presence for a celebration of life, and of depth. We may all be lost, but at least we are lost together. 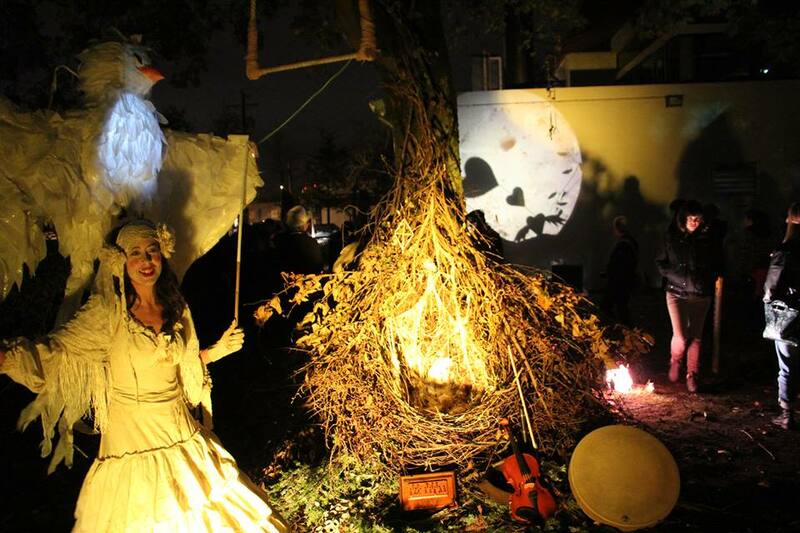 Conceptualized and produced by the beloved Public Dreams Society for over twenty-five years, the Parade lives on under the artistic direction of Kat Single-Dain and its co-producer of the last four years, The Dusty Flowerpot Cabaret. This year, all my puppet friends came out to play and were graciously puppeteered by member’s of our wonderful community! We created a fantastical world of art made from trash and recycled bits where we roamed and played with the thousands who came out for the parade. You, were invited to bring it, and bring it you did. Seriously…, neighbors came out in their full creativity. There were masqueraded selves, beautiful lantern’s built and shared, rolling shrines honoring ancestors. Workshops for performance opportunities such as the Sounders, the chance to learn Michael Jackson’s Thriller dance, and shrine making were full! People threw down amazing installations their own volition and some brought their own performance pieces. The veil between performer and witness was thin, which in my humble opinion made Parade of Lost Souls 2014 a complete success! This amazing puppet was created by the most talented Charlie Rae, otherwise known as A RAVEN CALLED CROW.